Boil the eggs and kip it ready. You can either divide the eggs into 2 halves or keep it whole. Now soak the rice for atleast 20mins in luke warm water. In a non stick vessel boil water and add rice and cook till half done. Add salt and half the lemon juice while boiling rice. Strain excess water and keep rice aside. In other non stick vessel heat oil/ fat now add in sliced onions and cook till transclucent. Add in chopped tomatoes and cook for a while. Stir in it ginger garlic paste, turmeric powder, red chilly powder, jeera powder, lime juice, curd, corriander leaves, salt, slit green chillies and chat masala powder. Stir well and cover and cook till all blends well. Now add in it boiled eggs and cook for a min or two more. Further add in it half boiled rice as making a top layer on the masala. Now add little water as required and cover and cook on low flame. Check for doneness after 10 mins and if needed keep the vessel on a tava and cook till all is done and aromas are out. Lastly garnish with chopped corriander leaves and green chillies. Serve hot and gain praises. 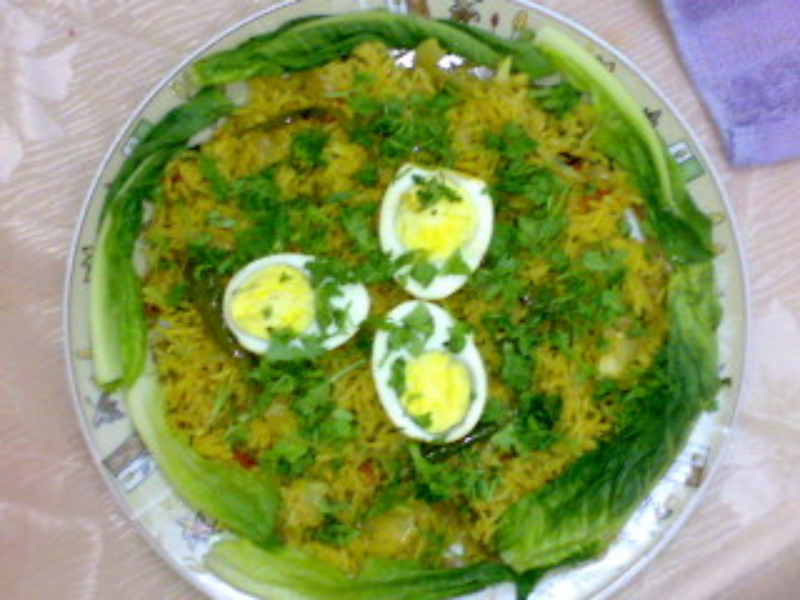 Hi Noureen i make your recipe egg biryani its very nice dish and very tasty thank you Noureen. Thanks for such a mouthwatering dish.